OASE self-cleaning filtration systems for large water bodies. BioTec ScreenMatic systems & ProfiClear Premium modular self-cleaning filters. OASE BioTec filter systems can be used to process larger bodies of water such as ornamental ponds and lakes. Two or more filter sets can be used to cater for larger bodies of water and each system is coupled with an optimally matched AquaMax Eco Filter Pump and Bitron self-cleaning ultraviolet Clarifier to tackle suspended single celled algae growth. 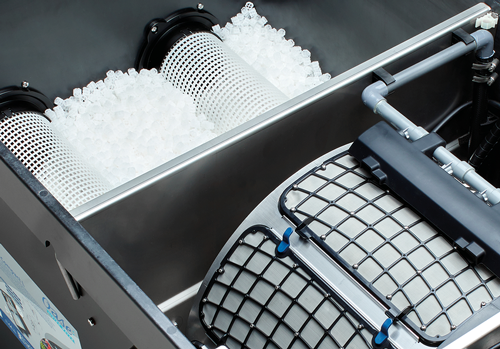 The BioTec ScreenMatic 140000 filter features a rotating screen mechanism which greatly reduces maintenance, capturing larger solid waste and transferring this debris to a collection tray. The ProfiClear Premium filter sets can be used on large ponds and lakes up to 200,000 litres. Once again, multiple systems can be used to treat much larger water volumes. The new OASE Bitron ECO UV Clarifiers can be used to tackle single celled algae in waters up to 240,000 litres per unit.